As you may remember from last year, San Sebastian hosts an annual Jazz Festival where bands from around the world come to share thier jazzyness. Joseba and I of course just had to go! Last year we saw quite a few jazz concerts, but this year it seemed as if there were less 'jazz' acts and more alternative/electronic/indie groups. So, while we got our fill of jazz on the side stages, we also saw some popular bands that rocked thier concerts on the beach to a swarm of people on the sand. One group that we found quite interesting was Crystal Fighters. I am not sure if they are popular in the States or not, but over here they are kicking up quite some dust. An English band that formed in Navarra, Spain (where Pamplona is), this electronic group was a headliner of the festival. While not jazz music whatsoever, I was happy to see a lot of Basque instruments in thier act. And seeing as we didn't take a single picture (all the ones on here are from the internet), I figured I could atleast take an opportunity to introduce you to some of the strange instruments this band used that are oh-so-Basque. First, if you click HERE you can see Crystal Fighters live playing a song that incorporates one of my favorite Basque instruments - the txalaparta (pronounced chal-a-part-uh). More or less a wooden xylophone, this two-musician instrument is quite traditional and weaves its way into the Basque cider tradition. After making the cider (sargardoa in Basque), the same wood that was used to press the apples was used to summon up the neighbors to come over and taste the ready-to-drink cider. While everyone happily drank the cider, the txalaparta was then used to play cheerful tunes to create a celebration of the harvest. Nowadays, this percussion instrument is very popular and from the times I have seen it played, incredible. With a few wood planks layed over two sawhores (sometimes covered with Basque sheep-skin or corn husks) and played with two large 'drumsticks' vertically, the music that comes from this simple instrument is crazy! Made more and more popular by talented Basques, it is becoming more popular in different parts of the world. With this Crystal Fighters group and thier Basque influence, they are bringing it to a world stage. 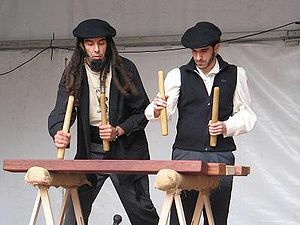 Another instrument they play is the danbolin (a type of drum), which is normally accompanied by the txistu (a Basque pipe). If you saw the videos from our wedding and remember the dance that my roommate did for us, maybe you caught a peep at the man in the corner playing both of these instruments simultaneously. In Basque, txistu also means 'to whistle', which is probably where this instrument gets its name seeing as the sound is similar. Normally the 3-holed flute is played with the left hand leaving the right free to bang the drum. These instruments are seen in almost every parade or celebration and nowadays are a symbol of the Basque folk music revival. An instrument that we didn't see at the Festival but that is worth noting is the trikitixa (prounounced trick-a-treesha) is a 2-row accordian that is all the rage here. In the States I think we have an image of the accordian being something a nerdy kid plays or something you hear on the streets of Italy or France while drinking wine and slurping spaghetti, but here, the accordian is a well-respected instrument that fits in nicely in the Basque music scene. Not such an old instrument, the trikitixa is rumored to have been imported in the late 1800s due to a photo taken in 1890 at a railway junction in Navarra. How it was imported is up for debate - railway via the Alps through France or Bilbao's port from Italy. 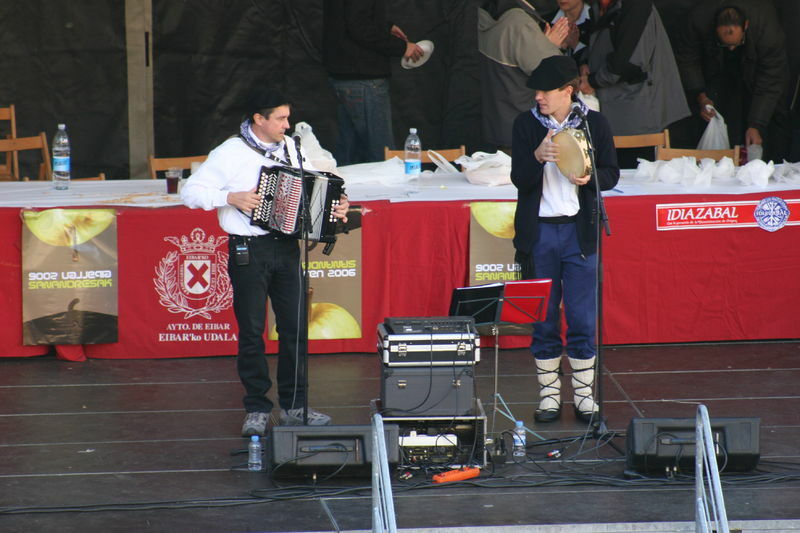 Regardless, it is still makes up an important part of Basque music and is usually accompanied by a tamborine and a singer. About two years ago I had a 12-year old girl student who took trikitixa classes, so I definitley believe that the accordian is still on the up-and-up over here! But don't be expecting me to impress you with my button-pushing and blowing any time soon! Well, since I didn't have much Jazzaldia news to tell you, I hope a swift overview of some Basque instruments I have learned of while here entertained you for a bit. 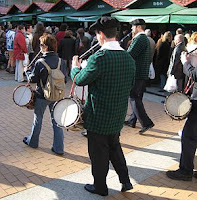 If you are intersted in seeing some Basque music, I will leave you a few links to youtube to listen and get a feel for what we see during each celebration/parade/festival/(basically any reason to be with your friends in the street!) to enjoy! Txalaparta: a pair of famous sisters making incredible beats! Txistu eta Danbolin: not the best quality, but you can get the feeling how these street bands just take over the entire road with thier drumming and piping.